Can you have a column of data moved to a single cell with commas separating the values that were in the column? Kind of reverse text to columns. to 1,2,3,4,5 in a single cell. in the next column next to the one you have values. Second, copy the whole column and go to another sheet do Paste Special-> Transpose. 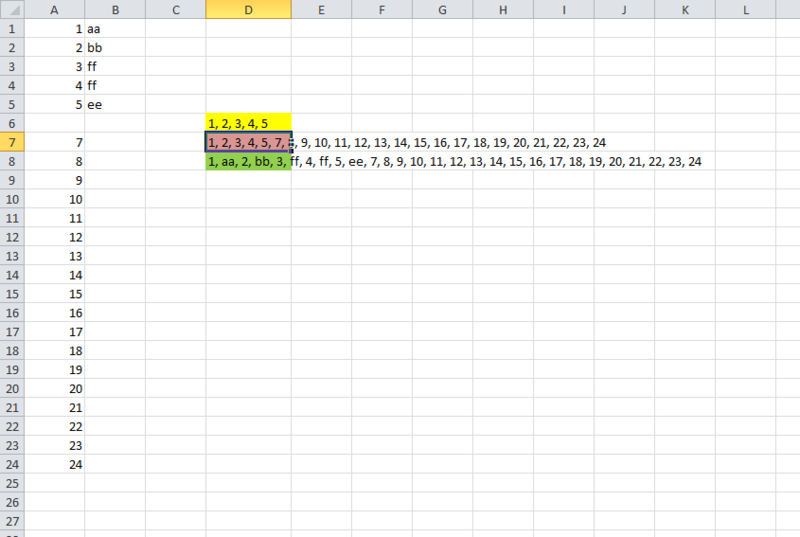 Now, copy B9 and paste in all the cells UP to the top of column B. In B1 you will now have you full result. Copy > Paste Special > Values. Amazing answer, karthikeyan. I didn't want to waste time in VB either or even to escape from Ctrl+H. This would be most simplest, and I am doing this. Insert a new row on top (A). Just above number 1 (i.e. on A1), type an equals character (=). Copy/paste a comma (,) from B1 to B23 (not in B24). Select A1 to B24, copy/paste in Notepad. In Notepad press (Select All) Ctrl+A, press (Copy) Ctrl+C, then click inside a single cell in Excel (F2), then (Paste) Ctrl+V. Notepad is the simplest and fastest. From Excel, I added in a column for running numbers in column A. My data is in Column B. Then copied column A & B to notepad. Removed the extra spaces by using the replace function in notepad. Copied from notepad and pasted back to excel in the single cell I wanted the data in. All done. No VB needed! The easiest way to combine list of values from a column into a single cell I have found to be using a simple concatenate formula. 1) Insert new column 2) Insert concatenate formula using the column you want to combine as the first value, a separator (space, comma, etc) as the second value, and the cell below the cell you placed the formula in as the third value. 3) Drag the formula down through the end of the data in the column of interest 4) Copy & paste special values in the newly created column to remove the formulas, and BOOM!...all values are now in the top cell. Here's a quick way... Insert a column of ", " next to each value using fill. Place a CONCATE formula, anywhere, with both columns in the range, done. The result is a single cell, concatenated list with commas and a space after each. How do I combine data from multiple rows in excel to one cell? Splitting concatenated Excel columns at spaces? How to break a spreadsheet containing CSV into multiple columns? How to find the address of the cell containing the max value in an Excel row, skipping every other cell in the row? How can I plot multiple columns as a single continuous series in Excel?